A new recording of Satie is always a reason for joy at Augusta. The piano four-hands form has a long and distinguished history with many major symphonic works by Brahms, Rachmaninoff and Stravinsky published in this form for a wide domestic market. For many years the great classical composers’ works had appeared in this form, including works by Mozart and Schubert, who wrote specifically for piano four-hands. In the days before LPs, CDs and MP3s this was how music was heard in the home. This CD of Satie’s Complete Works for Four Hands contains some of Satie’s most important works – Parade, written for Cocteau, Relâche, Gymnopédies Nos. 1 and 3, and his so-called ‘Furniture music’, Musique d’ameublement of 1917. 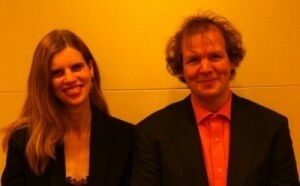 Piano Duo Sandra and Jeroen van Veen were established in 1987, and since then have toured extensively. They have also made over 40 CDs. They teach, adjudicate, and have a passion for bringing music to unusual locations such as railway stations! This Satie four-hand collection actually is more than complete. In addition to the composer’s own original works and transcriptions, the superb Dutch husband and wife duo throw in Darius Milhaud’s transcription of Cinéma (the Entr’acte from the ballet Relache), along with Jeroen van Veen’s duet arrangement of the first and third Gymnopédies in Debussy’s versions (added arpeggios, percussive effects and all). Van Veen also restores Parade’s opening Choral from the orchestral version that Satie omitted from his four-hand edition. Although the orchestral Parade’s wacky extra-musical implements (the siren, the typewriter) fall by the wayside, the duo’s spot-on tempos, perfectly judged characterizations, and seamless transitions between pieces remind me why I fell in love with this music. The Three Pieces in the Shape of a Pear (seven pieces, in reality) also stand out for the duo’s airtight synchronicity and diverse palette of articulations. They address the two Furniture Music pieces’ brusque, angular qualities, and hit upon the perfect dance tempo for La belle excentrique’s Cancan finale. Fine as the Duo Campion-Vachon’s freer, more intimately engineered interpretations may be, the nod now goes to the van Veens for outstanding musicianship and for Brilliant Classics’ attractively resonant ambience and wide dynamic range. This is a disc worth far more than its modest price, and a must for Satie fans. Sandra Mol (1968) en Jeroen van Veen (1969) ontmoetten elkaar tijdens het improviseren op de piano. In 1993 studeerden ze beiden af aan Utrechts Conservatorium, waar zij piano studeerde bij de bekende Noorse pianist Håkon Austbø. Het pianoduo heeft zich gespecialiseerd in tonale muziek waardoor de uitvoerders kunnen beslissen over de uiteindelijke vorm op het podium. Elk optreden heeft daarom een uniek karakter. In 1996 werd hun eerste CD Canto Ostinato uitgebracht in 43 landen. Van Veen & Co staan altijd open voor nieuwe ervaringen: ze hebben, bijvoorbeeld, opgetreden in Satire in 1997, het tweede Internetconcert van de TROS. Dit multimedia spektakel met muziek, theater, dia’s en film werd bekeken door 2000 on-line toeschouwers wereldwijd. Over a century since he first set tongues wagging, Satie (1866-1925) remains an enigma — though it has to be said that this half-Scottish Norman (1866-1925), who called himself “the oddest musician of his time” and claimed affinity with the fantaisistes, “all of whom are proper, right-thinking people,” did much to add fuel to his own legend. Yet this self-described fantaisiste has been said by John Cage to be “indispensable” for an understanding of contemporary music, and another eminent American composer and critic, Virgil Thomson, has stated that “Satie’s aesthetics are the only aesthetics of 20th-century music.” Satie was not a prolific composer. He wrote about a hundred pieces all told, most of them lasting a few minutes or even a few seconds. But as Cocteau pointed out, Satie’s work “is small the way a keyhole is small — everything changes the minute you look or listen through it.” One of the hallmarks of Satie’s music is that each piece he wrote is very precisely aimed at a particular social context and a particular instrument. Composed at a time when there was a piano in every home and when the usual way of listening to one’s favourite music was to play it oneself, Erik Satie’s works for solo piano are confidential in style, even down to the idiosyncratic performance marks — Sans orgueil (without pride), Avec une douce intimité (with a gentle intimacy), Avec une ironie contagieuse (with contagious irony) and so on — which are intended to suggest a mood to the performer rather than actual tempo or dynamics. Greatly affected by Debussy’s Pelléas et Mélisande, that unsurpassable masterpiece of an aesthetics which he had helped to create, Satie used this piece to take stock — as it were — of his own achievement, bringing together and reworking several compositions written over the previous decade. It is usually stated that the bizarre title of this piece was intended to mock Debussyfor having criticized Satie’s lack of attention to form. However, if any mockery was intended, it was probably aimed at the reactionary academic mandarins who had just criticized Pelléas et Mélisande for its lack of form. To answer his critics, he tacked a very un-Beethoven like Pastorale on to his Choral Fugue and called the whole thing Aperçus désagréables. Such was their taste for paradox, his friends (e.g. Florent Schmitt in an article in Montjoie! in December 1913) suddenly discovered that the work was not all that “unpleasant” at all. This piece is a concert reduction of the orchestral score of the ballet Parade composed by Satie to an argument by Cocteau and performed, with sets and costumes designed by Picasso, by Diaghilev’s Ballets Russes at the height of the Great War. For this ballet, now regarded as the start-ing point of the artistic revolution of the interwar period, Satie wrote what he ironically called “background music for Cocteau’s sound effects.” This recording is the first to incorporate these “aural illusions” theoretically intended for the orchestra. As a result, the listener hears, in between the keyboard passages, the “puddles” in which the Chinese conjuror splashes, the “typewriter” and “revolver shots” produced by the American girl (a typist with a craze for gangster movies) and the “sirens” that wail as the acrobats sail through the air with the greatest of ease. This work was composed for Cocteau’s Premier Spectacle-concert, at the time when Cocteau was the spokesman of Les Six, whose collective artistic creed was in fact Satie’s. The title alludes to the tripartite structure of the work and to the elaborate pâtisserie known as a pièce montée, utterly in keeping with the gastronomic connotations of the characters from Rabelais. Written for a number by the eccentric dancer Caryathis, this work belongs to the “music-hall” aesthetics propounded in the early twenties by Cocteau. For his “grand ritornello,” played while Caryathis did a quick change of costumes in the wings, Satie reused a café-concert tune, Légende californienne, which he originally wrote around 1900 for the “queen of the slow waltz,” Paulette Darty. The significant differences between the orchestral score and the duet version show how attentive Satie was to balance and tone colour. For the choreography of this number, Cocteau advised Caryathis to copy the movements of the animals in the zoo. Satie disagreed, writing: “though the Belle Excentrique can do the shimmy step, she is not a negress — she is a Pari-sienne, and very much so, as a matter of fact.” The day Satie died, July 1st 1925, Caryathis decided never more to dance and made a bonfire in her garden of the costumes and posters which had been designed for her by Bakst. She returned to the limelight a few years later, as the writer Elise Jouhandeau.